When David “Honeyboy” Edwards finally decided to settle in Chicago, he’d had a good twenty years on the road as an itinerant blues musician. He has travelled with some of the finest of the breed (Big Joe Williams and Robert Johnson, to name two), and had run up on the likes of Charley Patton, Son House, Tommy McClennan, Tommy Johnson, Willie Brown, the Mississippi Shieks, plus many more of lesser fame, but comparable talent. Today, Edwards remains as one of the few surviving links between the older styles of Mississippi country blues and present trends in the music in the city of Chicago. It was not an easy existence, but it was possible to make a living in the blues during those times . . .to survive. Honeyboy finally settled in Chicago during 1954 at the urging of his family, who had already established themselves there. In the city he played regularly with Louis and Dave Myers, Sunnyland Slim, Jr. Wells, et al at places like the 708 Club, the Cozy Inn, or Cadillac Baby’s place. While he continued to play or sit in with bands after the fifties on an irregular basis, Honeyboy is now more established as a solo performer at concerts and festivals, becoming one of the few Chicago bluesman to do so on a regular basis. He has recently toured Europe (an album of an Austrian performance can be found on the Roots label), and was one of the welI-received performers on the “Foghat Salute to the Blues” concert in New York at the Palladium. Edwards will be off on a Japanese tour after these notes are “put to bed”, but will return to his regular weekly gig at “Elsewhere”, a North-side blues tavern (this with Kansas City Red, Floyd Jones, and Michael Frank). Recording is the one outlet that has generally eluded Honeyboy. At one point during the thirties, he was supposed to have gone to Chicago with Charley Patton to record for Paramount (under the aegis of scout H.C. Speir of Jackson), but the trip never materialized. In 1942 he recorded twentv-two selections for the Library of Congress as a result of an Alan Lornax field-trip passing through C|arksdaIe, Mississippi. Only one song was issued during the Sixties (“Worried Life Blues” on LC 59) by the library, and hardly a commercial release at that (n.b. – Flyright Records in England plans to release the complete session). Edwards’ first commercial session came in 1951 Houston for Lois Anne Cullum’s Artist Record Co., with two sides being released on a rare 78 as by Mr. Honey. Other sessions took place for Sun (Memphis) and Chess (Chicago) during that decade, but the sessions remained unreleased until more recent times. “Sweet Home Chicago” from Sun is now available on the English label, Charlv, but improperly credited to the pianist Albert “Joiner” Williams, while “Drop Down Mama” was on a Chess Vintage anthology. Since then, a few recordings were done by aficionados like Pete Welding, and Gene Rosenthal/Mike Stewart, but little has been in release. An appearance was made on the Fleetwood Mac sessions in Chicago during the late sixties for Sire Records, but his contributions to the issued cuts seems inaudible. This album, then, is the first full American LP release under his own name. Examples of this abound on the album, occasionally with able assistance from his old friends, Big Walter Horton, or Eddie El. Honeyboy’s business card reads – “Guitarist – Blues & Rock” – and, in fact, he can do perfectly respectable, rocking modern blues tunes. 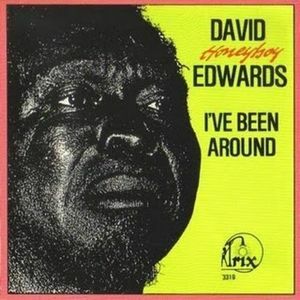 For the blues fan who appreciates more than just “get-down-and-boogie”, Edwards’ deeply-felt traditional blues should satisfy, He is one of the last remaining practitioners of that art, and this album gives a fulfilling portion of it to the listener. 1- Living Blues #4: interview by Bruce lglauer, Nigel Watson, Kathleen McLaughlin, Diane Allmen, Bill Lindemann, and Willy Leiser. 2- Blues Unlimited #54: interview by Pete Welding. The then-editors of Living Blues magazine (Jim & Amy O’Neal) suggested that it would be a good idea to record a couple of the older Chicago-based blues artists as solo or acoustic performers. One of their primary candidates David “Honeyboy” Edwards, then one of the most under-recorded names in Chicago! Jim and I went to see Honeyboy in 1973 at his apartment on the South Side, and we decided we could work together. Inauspiciously, some local vandals had broken a couple of windows in my van in a burglary attempt. The presence of my dog, Ruby Chewsday, kept them from succeeding . . . Honeyboy’s comments were caustically pointed and won’t be repeated in print! * That didn’t dampen my enthusiasm at the prospect of recording this legendary blues artist, though. Sessions were lined up over the next couple of years, the first taking place in the O’Neal apartment/Living Blues headquarters, while the others were done in Bruce Iglauer’s cellar, then the Alligator warehouse! I don’t know who suggested getting Big Walter Horton to play with his old-time buddy, but Bruce facilitated that and four cuts from that session are on this release. I also wanted to use a second guitarist, no easy feat with Honeyboy’s sense of “time”. The late Eddie El was contacted (and interviewed in depth, the tape left with Jim) and he was able to fit in well with Edwards and three of those songs are used here (Eddie backed Arthur Crudup on a Delmark release, so he could follow anybody!). The end result is a Iot of variety on this release. So in ’78 this collection was assembled, the first full album of Honeyboy in an old-time stance. Reminiscent of his days as a travelling blues troubadour, this is a lovely in-depth slice of Edwards’ talent. He can also be heard on other releases on such labels as Folkways, Evidence, Earwig (which includes his Library of Congress sides). 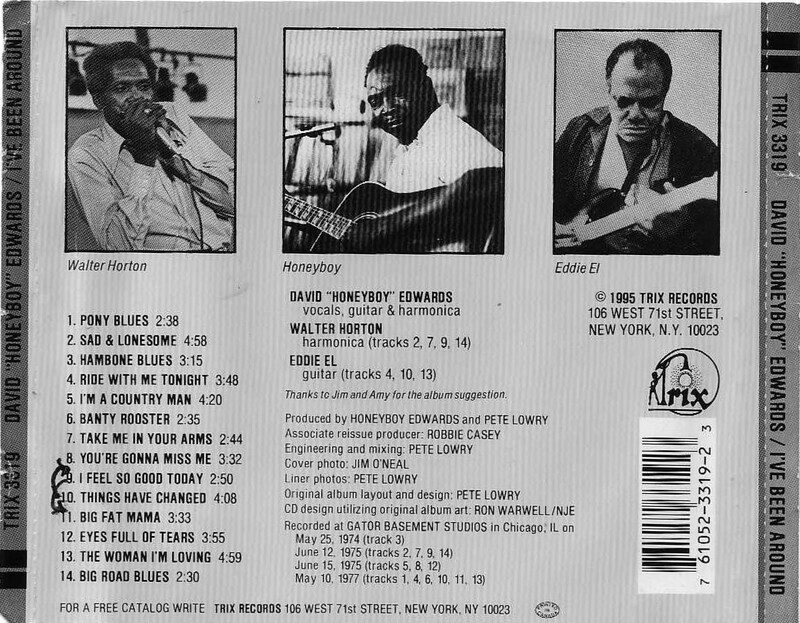 A last remaining connection to the old “Delta” blues (Charley Patton, Robert Johnson, Big Joe Williams), Honeyboy Edwards can be savored at length on this CD, like old wine . . . drink deeply! Honeyboy had a great late career, winning Grammies and appearing at one of Barack Obama’s presidential balls in 2008. He was lauded both in the States and Europe, finding himself in films (“Walk Hard: the Dewey Cox Story”; he played the Black mentor to the fictional musician of the title!) and major concerts (Eric Clapton in London). I did not have much contact with him after the album was released, for no special reason besides time and life interfering. 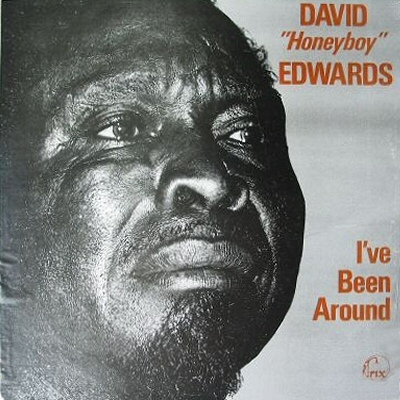 Michael Frank in Chicago (Earwig Records) took him on, recording him for CD release as well as collecting interviews for and head-manning Honey’s fine autobiography (THE WORLD DON’T OWE ME NOTHIN’: The Life and Times of Delta Bluesman David Honeyboy Edwards  Chicago Review Press). Having gotten his first full length LP out and about, my work was done and others took on the responsibility. He was a fine man, easy to work with and appreciative of my efforts, both in setting up and producing the four sessions as well as making the album available as best I could in difficult times for blues music. I am proud of what I accomplished and that he had a successful “latter days”, something kind of rare in the often nasty music business! He took it all in stride and kept a positive attitude at all times – he deserved all that he got professionally in life. Sometimes there are third acts in life, contrary to what F. Scott Fitzgerald’s statement tells us! For more on Honeyboy Edwards, see O&S #25.